"If you ask for 3 quotes, your information will only be provided to a maximum of 3 solar power companies who serve your area. Each installer is only allowed to use your information to give you a solar quote. If you check the box saying you are looking for finance we will provide your information to Parker Lane to contact you about your solar finance options. We will only do this after you submit your request for a quote and you have consented to being contacted by Parker Lane. Parker Lane is a trading name of Upside Downside Pty Ltd Australian Credit License number 482276, and has appointed us as its corporate credit representative. Our credit representative number is 482276 . We will receive a fee for a successful referral to Parker Lane which results in a loan. Parker Lane is required to disclose any fee payable to us in their documentation to you. We hate spam as much as you do. We will never pass your information on to anyone except the 3 solar installers and Parker Lane unless you give us your explicit permission to do so. 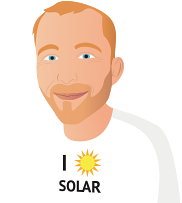 We will send you emails walking you through the solar buying process, asking you for feedback and may send updates on the solar industry and occasional offers that we think may be of interest to you. Every email will have a prominent unsubscribe link if you don't want to receive them any more." 1. We are committed to protecting your privacy. We have set out what information we collect about you when you visit our website and how we use that information below. 5. We will only collect your personal information by lawful and fair means. 6. We may store the information that you provide us (as described at Clause 4) on servers hosted overseas when carrying out any of the uses described in this Policy. 7. If you choose to provide us with a review of our service or of the goods or services you receive from one of a supplier, we may store that review and post it to our website. 8. If you provide us with your name and e-mail address we will store your name and e-mail address and use it to send you occasional newsletter emails until such time as you inform us that you want to unsubscribe using the unsubscribe link at the end of every newsletter email. 9. We may monitor the content of any e-mail you send to us for troubleshooting or maintenance purposes, or if we suspect any form of e-mail abuse. We will preserve the content of any e-mail you send to us if we believe we have the legal requirement to do so. 10. Except as specified above, we will not, without your permission, sell or otherwise provide your personal information to a third party, or make any other use of your personal information, for any purpose that is not incidental to your use of our website. To avoid doubt, we will never use your personal information for any purpose not listed in this Policy, or that a reasonable person in your position would not expect. 11. In certain circumstances, we may aggregate the personal information that we store for the purposes of analysis, but, if we do, we will ensure that the information is made anonymous first. 13. If you request us not to use personal information in a particular matter or at all, and that personal information has been disclosed to an overseas recipient (as described at Clause 6), we will take all reasonable steps to comply with your request. 14. We will keep all of your personal information confidential to the best of our ability while it is in our possession. However, we cannot and do not guarantee the security of your personal information as it is passing over the Internet. 15. You are entitled to have access to any of the personal information that you have previously supplied to us and that is in our possession, and you are entitled to change or delete such information except where we are required by law to retain it.